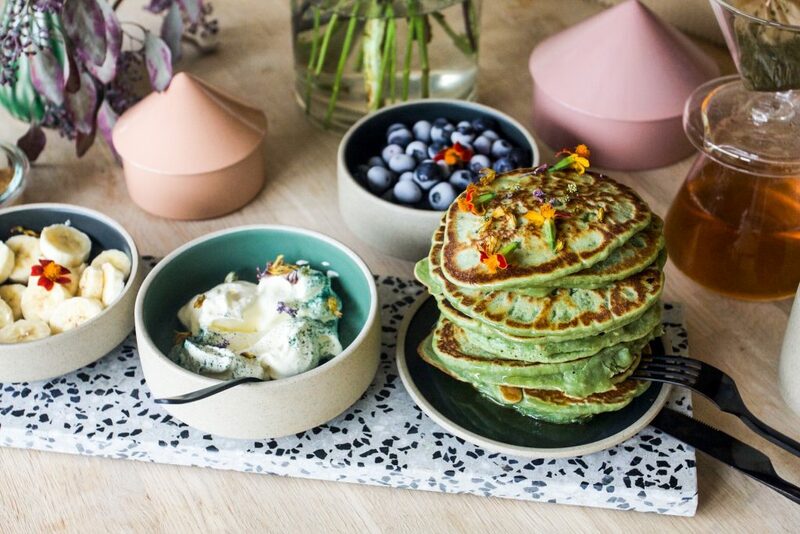 American spirulina oat pancakes, how do you like the sound of that? I have been a big fan of spirulina for a long time, way before it even got trendy. I like that it’s healthy and I adore the beautiful colour. This green and blue superfood is an alga, and just as little as one tablespoon a day can have major health benefits for you. You can read more about here. Spirulina has been called the most nutritious food on the planet. So you can understand why I wanted to introduce it to my kids. Now my kids love sushi, but peel of the Noori, because they simply can’t eat seaweed. Selling algae for breakfast proved a little bit challenging. So what’s a mama to do? American spirulina oat pancakes, of course! This proved very popular. They were even amazed by the beautiful gree blueish colour. The flavour doesn’t come through. Especially if you add toppings to your pancakes. Of course, if you don’t mind the spirulina flavour, add a little more than the recipe says and it will come through. If you want more of a rich pancake, this does the trick. Either way, try it, you won’t be disappointed.